The land in Deception Pass State Park was settled by the Samish and the Swinomish and they lived off the land until the early 1900s. Deception Pass gets its name from a mistake by Captain Vancouver; he mistook an island for a peninsula. The cantilever truss Deception Pass Bridge was completed in 1935 linking three islands together, Whidbey Island, Pass Island and Fidalgo Island. Deception Pass is a strait connecting Puget Sound with the Strait of Juan de Fuca. Below the bridge the tidal flow can be extremely rough with turbid waters and whirlpools. This turbulence is caused by massive volumes of water trying to pass through the narrow strait between the islands. You can see the swift current from the pedestrian walkways on the bridges or the trail on Whidbey Island. Deception Pass is the most popular state park in all of Washington. It attracts everyone from hikers to kayakers. It has 3 lakes, over 30 miles of trails, about 6 miles of equestrian trails, old growth forests and breathtaking views, and an abundance of wildlife in sea and sky. Obviously there are camp sites but there is also marine camping available. There are freshwater and saltwater boat ramps and docks, however there are electric motor restrictions on two of the lakes. It is also very, very close to Whidbey Air Force Base. And this has caused loads of problems with weekend and holiday campers. They come for serenity but end up with jet engines darting across the sky for hours. The other downside can be the weather. Because it is situated on the coast of the pacific northwest, fog is prevalent. The pass not only creates fog but it can hold on to it for nearly half the day, in which you will find yourself bundled up in layers of clothes. Above: The purple ochre star is a carnivore. They are known to be the principle predator of the Pacific Coast intertidal. Their preferred food source is the California Mussel. 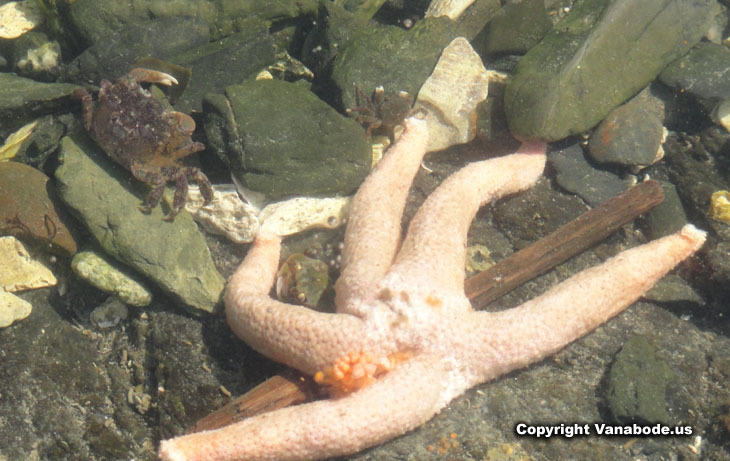 What the starfish does is wrap its arms around the mussel and then pry's the shell open. 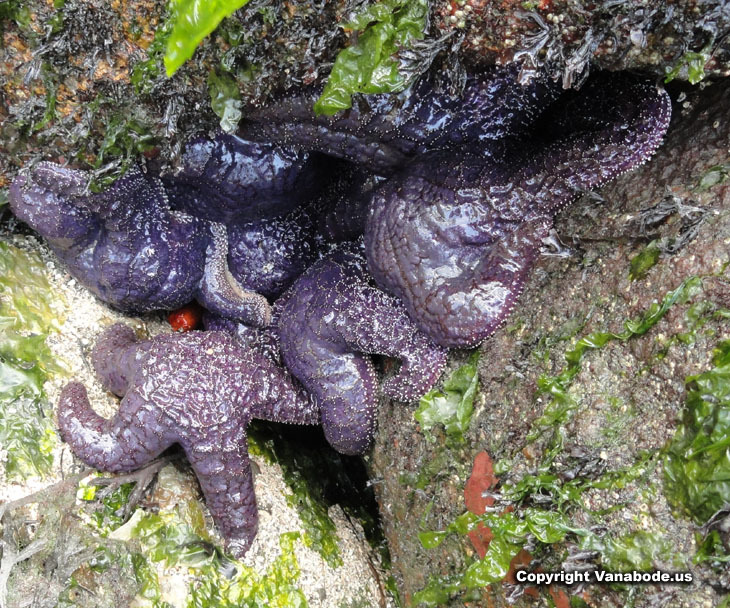 However, the sea star will also feed on a variety of other crustaceans, like barnacles and small crabs. Besides humans, sea gulls and sea otters are their only predators. But the gulls eat very few star fish and the sea otters only eat the arms. Because the ochre star can regenerate it's arms it does not die. Above: The purple shore crabs are found in intertidal pools and under rocks. They can be found from Alaska to the Oregon coast and all the way to Baja California. They primarily eat sea lettuce and other green algae and eat on dead sea creatures too. They are highly valuable to the oceanic environment by keeping the beaches and tide pools clean by scavenging. 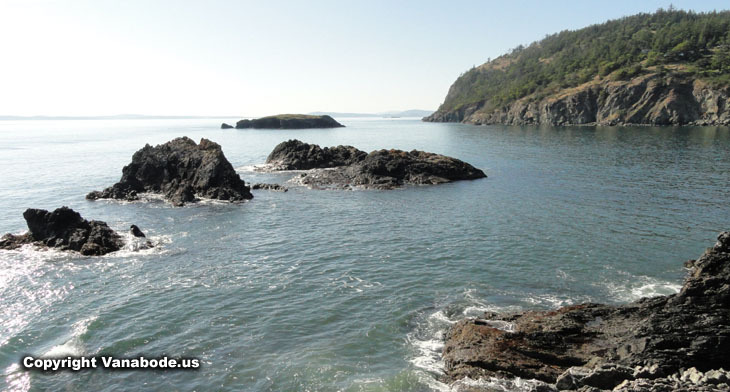 Above: Deception Pass' Northwest Island is a popular spot for diving either from your kayak or boat. The currents make it difficult to access at times but the abundance of sea life is spectacular. There are large beds of sea urchins and scallops, schools of perch and rockfish. And of course the ever present and beautifully flowing kelp along with sponges and so much more. Above: Giant Green Anemone are relatives of jellyfish, corals and sea pens. They are a master at cloning themselves. One anemone can create large groups of genetically identical anemones. Eventually clones will expand and run into another group of clones with different genetic makeup. An anemone battle will inevitably ensue. To fight they use their bulbous clubs full of nematocysts to sting the encroaching anemones. They continue to sting each other until one dies or draws away. 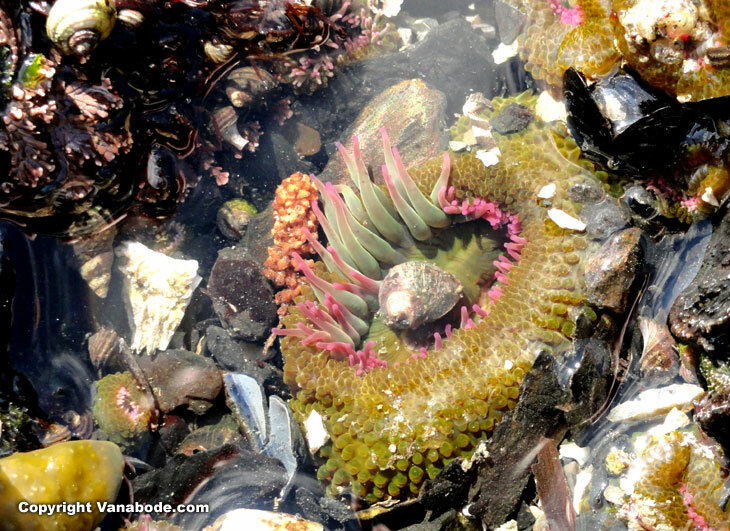 The giant green anemone is one of the most popular and sought after animals among the tide pools along the Pacific Coast. They dine on detached mussels, sea urchins, crabs and small fish. Besides humans, their predators are sea spiders and sea snails. Just like the Purple Shore Crab, they can be found from Alaska to Central America. Try to be careful while walking around tide pools. All of the creatures are very sensitive and beneficial to our oceans and beaches. 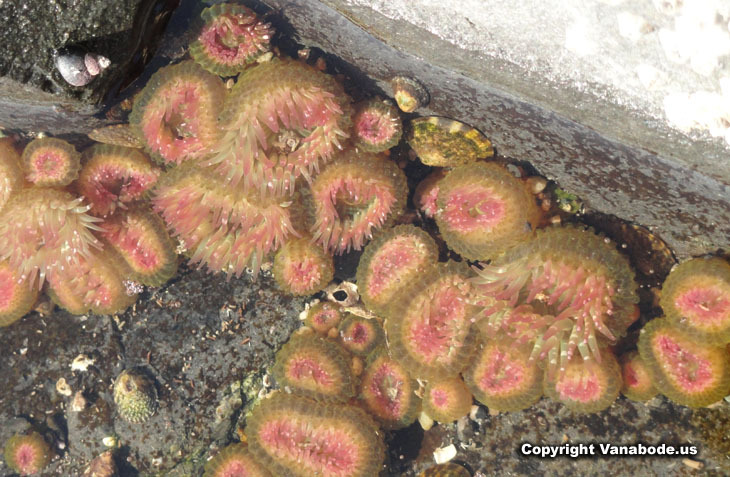 Out of water anemones will have their tentacles retracted into their bodies which make them look like a wet lump of rock, but they are still alive. They do this to prevent from drying up while the tide is out. If you step on one it will squirt water out like a fountain, but it might now be dead. Above: Every tentacle of the Giant Green Anemone is covered with thousands of tiny stinging capsules called nematocysts. Each of the nematocyst contain a coiled hollow tubule. Some of the tubes carry a small amount of poison which is capable of paralyzing or killing small animals. When a small fish, shrimp or crab comes into contact with the tentacles they harpoon their predator with their barbed tubules. The stinging capsules pierce the skin of the animal and inject poison. This tubule holds on to its prey and the anemone moves it tentacles around constantly poisoning until the prey is subdued. From there it moves the crab, shrimp or fish to its mouth and swallows it whole. The nondigestible parts like shells and bones are spit out. The anemone's nematocytes are not poisonous to humans. 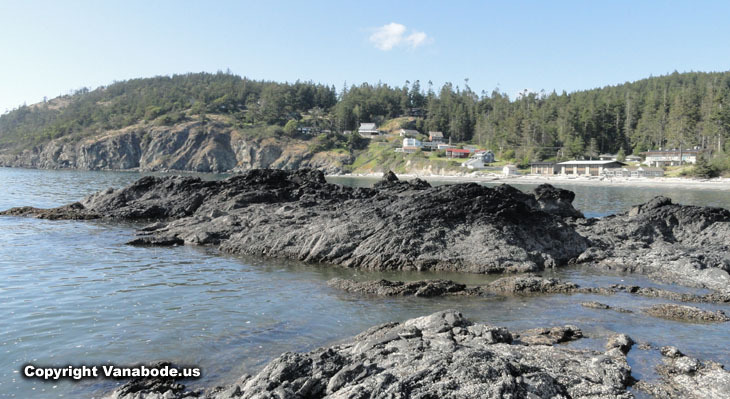 Above: Rosario Beach is a marine protected area where you can swim and dive or stay on the beach for a barbecue and walk around the tide pools. Parking is very close with easy access trails to the beach. There is a grassy picnic area with tables and restrooms near by. 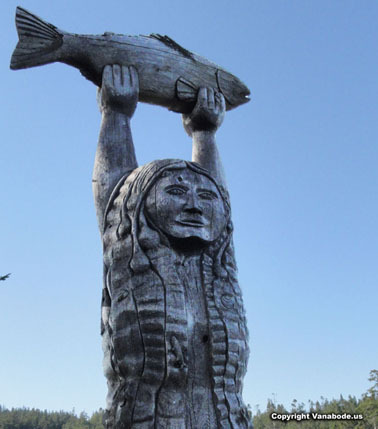 The Maiden of Deception Pass totem pole is located between Rosario Beach and Sharpe Cove. The Walla Walla College Marine Station is located at Rosario Beach. 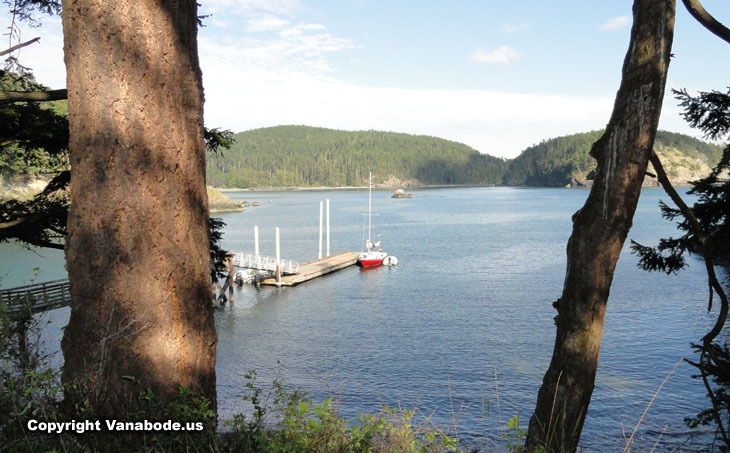 Above: Sharpe Cove boat ramp at Deception Pass State Park. Daily fees are charged for moorage at docks, buoys and floats. Pumpout services are available within the state park. More than 2 million people visit this park every summer. This Vanabode trip was taken in June. We had almost perfect weather every day and absolutely no crowds. If we had waited until July or August to take this trip we would've been part of the millions and probably wouldn't have enjoyed it. No matter what kind of traveling you do timing is everything. Do you see how empty Rosario Beach is, above? We had a fantastic time and saw brand new things and creatures at Deception Pass Washington. Click Vanabode Washington for more information and pictures.